Infographinomicon: From W.A. to W.S. There is apparently a strong sentiment of 'what about me?' in the electorate at large which betrays a fundamental naïvety of how elections work. The simple fact is that, as far as lower house voting goes, most of us don't matter that much. I certainly don't, because my seat (Mayo) will stay firmly in Liberal pockets (assuming the Liberals can avoid any screw ups several magnitudes larger than any in the last 50 years). Last election was going to be “lost and won in Queensland”, although Sydney did get a mention. The rest of Sydney can see how much greener the grass is to the west, at least in terms of political focus and promises, and inner Sydney is not used to being shown up. Melbourne, Brisbane and other metropolitan centres aren't too impressed either. Not many people are particularly enchanted with “either party” of politics (because there are only really two parties, right?) and therefore anything “either” does is demonised. Labor in particular cannot to anything right (perhaps because that is part of The Narrative as Andrew Welder suggests) and Labor is really the driving force behind the Western Sydney focus. The Coalition is happy to play along because the longer they spend fighting over the working and lower-middle classes the longer the Coalition can expect the support of everyone else by default. The fact that Labor has not (and possibly cannot) communicate with anyone else has been noted by others. There was a similar feeling in 2010 when both sides were serenading the independents to form government. One news station that displays tweets* included one with the general sentiment of 'I wonder if we would be receiving more attention if we had voted for an independent?' The simple (and I think obvious) answer would have been yes. But independents can be comparatively less effective in non-hung parliaments where they do not hold the balance of power. Even candidates from major parties like Labor and the Coalition have limited power when in the majority and even less when in opposition. In a democracy all voters have a say, but in a nation of 21 million you cannot expect a big one. Nor can you expect all voters opinions to be treated equally. Donors with mountains of money will always have a bigger say. Supporters of representatives who hold the balance of power in either house will always have a bigger say. And in election years, voters in marginal seats will always have a bigger say. Voters like those in Western Sydney. But These People Have A Point! I mentioned that Queensland was seen as key in the last federal election. Both parties put a fair few resources into that state, and Labor lost seven seats, leaving them 8 of the 30. Many people point to just one equation to explain this. Rudd, of course, was a proud Queenslander. I think its a bit more complicated than just that, but that is neither here nor there. Rudd was a definite factor in Queensland and elsewhere. I guess you could argue that in the end Queensland was instrumental. Labor lost ground there and nearly lost government. That is Eddie Obeid, if you didn't recognise him. So is this. While investigations are ongoing, it has been oft repeated that Obeid has ruined Labor in NSW for a whole generation of voters. 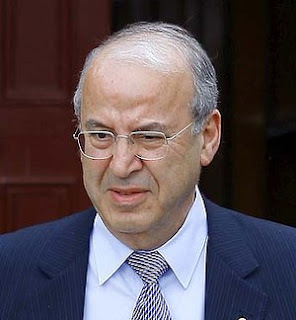 I think that's probably overstating it – most people will be saying 'Obeid? Who's that?' in an election or three – but it does make Labor's brand pretty toxic in the Sydney area. Labor could always hope that people don't confuse federal Labor and state Labor, and vote accordingly. But you see the thing is: Western Australia. If voters are willing to punish WA Labor for Gillard policies, what are the odds Sydney voters won't let state Labor controversies colour their federal opinions? Still, six months is a long time in politics. Perhaps Labor can claw back some support by then but, as plenty of other, more influential bloggers have pointed out, the ALP's chances are greater elsewhere. The key idea in these articles looks at “winnable seats” for Labor based on the Mackerras pendulum. I'll be using the under-6% definition of marginal that has served us well so far, so my results will differ a little from Gordon Graham's (the last link) which looked at seats under 5%. 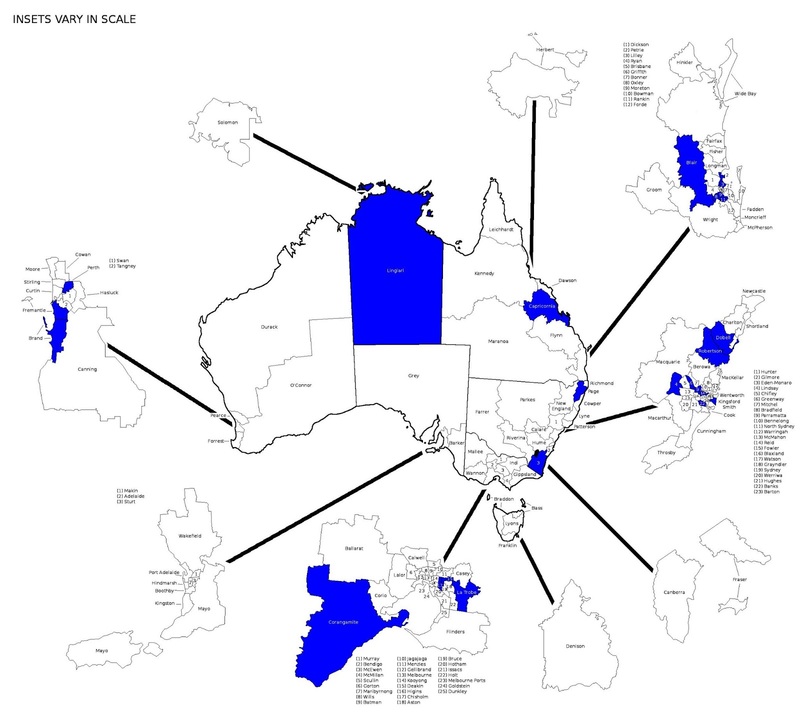 The majority are in Queensland (10) followed by Victoria and NSW (6 each), WA (4) SA (2) and NT and Tasmania (1 each, with Tasmania's seat being Denison and taken from an independent). Mr. Graham suggests that the Obeid matter is fatal for Federal Labor in NSW, and that the ALP in Victoria and SA have pretty much maxed out their support. Denison is also considered safe for the independent at this early stage. After the WA state election I would expect we can rule out many ALP gains there as well, short of a massive turn around. All of this only serves to further highlight the importance of Queensland, and it has been suggested that the anti-anti-Rudd sentiment in that state may have weakened since the ALP took a thrashing three years ago. 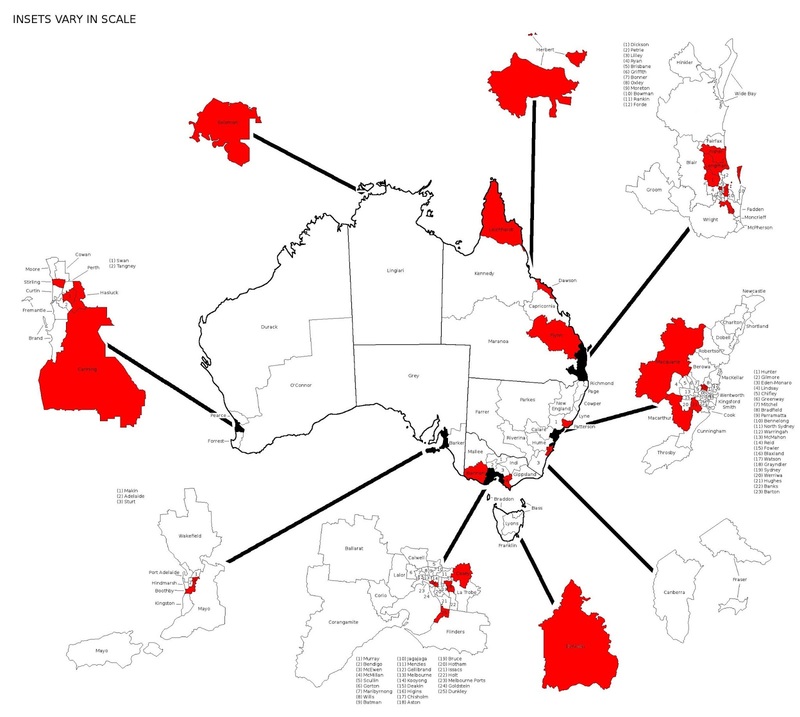 Which ALP Seats Are Losable? 1 in the Northern Territory, 3 in WA, 4 in Victoria, 7 in the Sunshine State and a whopping 12 in NSW. These include Banks, Greenway, Lindsey, Parramatta and Reid within 'Western Sydney'. The PM's visit to the area was based in Rooty Hill in Chifley – a Labor seat, albeit a safe one. Labor isn't trying to win seats, it's trying to not lose them. They're sandbagging – a phrase you might have heard several times in the Western Australian election coverage if you were so inclined to watch. When the tide was clearly favouring the Liberals and Nationals in WA, who were expected to wash away many marginal seats with a flood of votes, the Labor party started sandbagging. This is a process where you fortify the marginal seats against your opponents, at the expense of safer seats. Perhaps you think you can save more than you'll lose. Perhaps you trust the safer seats to hang on. Or perhaps you are playing the long game like Mark McGowan appears to be, retaining the marginal seats in order to have an advantage there next election, when you plan to win back your formerly staunch support base. I don't think federal Labor is doing any of the above. What I think is really going on here is the ALP trying to assess what the damage is in NSW. If they think they can recover, they'll focus on this area up until polling day, with a few open plays for Queensland and perhaps WA. If not they can either abandon the “new Liberal heartland”, or keep the focus there as cover while introducing plans that will hopefully pay dividends in Queensland and other areas without directly drawing the Coalition's attention away. I said that Labor was leading the charge on Western Sydney and that the Coalition was happily playing response, safe in the knowledge they have a good chance of holding this “heartland” and can probably win without it anyway. At a deeper level, though, it is Labor who has been out-manouvred. I think federal ALP sandbagging is a lot of playing catch-up – a catch-up campaign that looks disturbingly like a mere continuation of the WA state sandbagging, and the 2010 federal sandbagging, and the SA and Tasmanian sandbagging before that. In 2010 sandbagging just preserved Labor's grip on power. It is a strategy that is unlikely to hold back two tidal waves in a row. * I'm not a twitter user, but I must admit it is generally a pretty good forum for venting your frustration where no one (outside your own friendship group) is going to hear you. Much like screaming into the vacuum of space. Or writing an election blog. Why you would add in a news broadcast with a hashtag is beyond me. If your five minutes of fame is 140 characters on the bottom of a TV screen then … well, I'll let you judge what that means for yourself personally. I would rather be noted for making some kind of contribution to society, but whatever floats your ego, I suppose. Hi, can you, either in a comment or in a separate blog post, please explain why Julia Gillard and Tony Abbott are the leaders of their respective parties? As far as I can tell neither bring anything to the table, they are both bland and uninteresting and seem incapable of doing anything relevant to actually running the country. Both Kevin Rudd and Joe Hockey are more charismatic and seem much more capable of getting things done and having plans and policies and communicating them to the people. Not only are there apparently better candidates in both parties, polls regularly indicate that Rudd and Turnbull are more preferred as leaders of their respective parties. This is not quite as straightforward as all that of course, because if it isn't complex, it isn't politics. My next post will naturally include a discussion of the recent leadership non-event in the Labor party. I expect to touch on these issues then.